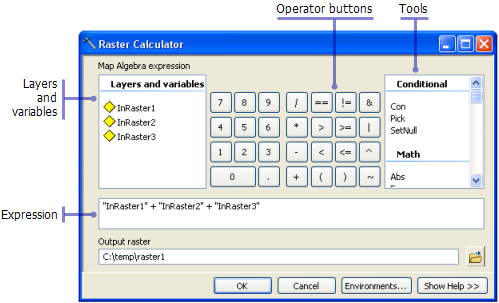 WHILE CALCULATION AN EXPRESSION HOW TO PERFORM SUMMATION WHICH IS NOT FOUND IN RASTER CALCULATOR. Move to the Spatial Analyst Place in order to get an answer. Summation (I assume you mean adding pixel locations between rasters) in the Raster Calculator is achieved through the plus sign. I mean summation of values from i=0 to i=24 (not simple addition).summation(sigma) is not found in rater calculator. Their is no sigma...you either select and add the grids one at a time using the raster calculator or the Plus tool within a loop in a script that you will have to write. SIR FINAL I GOT 3 RASTER MAP FOR(P*R,C*K,TIMES).ACTUAL WHAT IT MEANS?DO I HAVE TO MULTIPLE THESE 3 TO GET FINAL VALUE? what about to solve this equation sir? is it possible? sir any trail version vailable for this tool EnvSys_SoilErosion? You wouldn't by any chance be trying to save this to a USB drive/key would you? SOIL EROSION VALUE IS THE RASTER WHICH MEANS TIMES? S THIS VALUE IS SEDIMENT YIELD IN TONES/HECT/YEAR? OR ANY CHANGE IN UNITS? The invalid output workspace might be due to the single quote in the name. Avoid any special characters in the path, don't use spaces and don't use long names. This may cause errors. Rename the folder "ALL DATA" to "ALL_DATA". I HAD GIVEN ALL THE PARAMETER IN RATER(AS PER SPECIFIED),AND WORK SPACE IS ALSO GIVEN PROPER(CHANGED THE ALL_DATA).STILL SAME ERROR? WHAT TO DO SIR? You can just download the toolbox: http://www.envsys.co.kr/~sateec/toolbox/EnvSys_SoilErosion_Toolbox_ArcGIS_ModelBuilder.zip as stated on the website (Soil Erosion / Sediment Yield ArcGIS Toolbox Kangwon National Univ. ) and if you have Spatial Analyst, you will be able to use the toolbox. No need to have a trail version. Do you have a D-drive in your system? Please change the output file path for each tool with valid path-names for your system, in the model-builder. SIR D drive is not available, what to do in the edit option?can tel the steps to be done? The issue is that the output location in the tools refer to D-drive, which is eventually not there in your system, thus the error popping up. In the model-builder window, double-click the tools (in orange) and define valid output file path. The default model had D-drive in path. Verify for all the tools. Also make sure you replace the DEM with the DEM file available with you. Also verify K_factor, C_factor, P_factor, and R_factor. SOIL EROSION VALUE IS THE RASTER WHICH MEANS TIME? IS THIS VALUE IS SEDIMENT YIELD IN TONES/HECT/YEAR? OR ANY CHANGE IN UNITS?